The hard yards put in during pre-season training paid off this weekend for Tigers, with a number of teams racking up their first win of the season. First grade were one of the sides to put points on the board after a frustrating opening two weeks had seen them slump to an 0-2 record. Returning to Peter Burge Oval for the second week in a row, the Tigers piled on 269 after winning the toss and electing to bat on a wicket tailor made for stroke makers. Leigh Drennan was the savior for Redlands, scoring a masterful 115 from 112 deliveries to stop the rot that had seen the top three Tigers batsmen depart without doing much damage on the scoreboard. James Bazley (84) provided the perfect foil for Drennan, and was also a key figure in the Tigers’ comeback. Both he and Drennan departed with the score on 241, before a late order collapse consigned the Tigers to a sub-300 total. But a strong start from the Tigers’ bowlers quickly allayed any fears that they didn’t have enough runs on the board. James Bazley backed up his efforts with the bat to claim three wickets as the Sunshine Coast edged their way towards the Tigers’ total. Bailey Stewart and Jamie Ryan also fired with ball in hand, taking three wickets apiece and assisting the Tigers to dismiss the visitors for 256. Second grade went down in a high scoring battle with Sunshine Coast away from home. This game also featured a number of impressive individual performances. After winning the toss and electing to bat, the Sunshine Coast piled on 309 for the loss of 6 wickets, with Rob Ballarino the only Tigers bowler to really trouble the batsmen. His performance was complimented by a number of economical spells from the Tigers’ opening bowlers, but it wasn’t enough to stop the home side from surpassing 300. The Tigers lost two quick wickets in response, but skipper Cameron French (91) came to the fore to help steady the ship. He and Josh Fraser (32) shared a 127 run partnership for third wicket, before Jimmy Carr’s 74 in 44 deliveries almost saw the Tigers home. But when he departed with the score on 250, the Tigers’ run chase quickly fell away. This late innings slide saw them fall 32 runs short of the home sides’ total. Fifth grade opened their account in the first game of the season against Sandgate-Redcliffe on home soil. While first grade were fighting hammer and tong on field one, fifth grade were slaughtering the visitors’ bowling attack to rack up 270 runs in 40 overs. David Brook was the chief destroyer, scoring a magnificent 96, while Trent Conwell (65) also punished anything and everything the Sandgate bowlers dished up. A fast start from the visitors sent a few shock-waves through the Tigers' bowling cartel, but a masterclass from the likes of Alex Ward (2/12), Chris Barker (2/21) and Trent Conwell (2/23) saw the Tigers through to victory. The first sixth grade game of the season featured a battle between the two Redlands sides on Ron Field Oval. Unlike the games playing out on field one and two at Tiger land, this game didn’t feature heavy run scoring. In fact, sixth grade one were dismissed for just 63 thanks to a sensational spell from Harry Short, who claimed 4/8 to stun the opposition batsmen. Sixth grade two lost 3 wickets in pursuit of their teammates’ total to secure their first win of the new season. Sixth grade three, who are this year taking part in the Warehouse B2 competition, are also looking the goods as they head into the second week of their two day clash with the North Spartans. A fine innings of 58 from Jake Davies, who was ably supported by Ryan Short (44), helped the Tigers post a respectable first innings score of 193. In reply, the Tigers have the opposition 2 down for 15, with Jack Robinson the man to claim both wickets. The Redlands Tigers Lord’s Taverners side continued their stellar start to the 2018/19 summer of cricket, defeating South Brisbane on Peter Burge Oval. The Tigers entered this clash high on confidence after their efforts against Ipswich/Logan in the opening round, and despite not taking as many wickets as they may have hoped during the first 25 overs of their bowling innings, restricted the visitors to a below par total of 183. Tom Biggs was the key man for Redlands and changed the game with three big middle order wickets. Zac Maguire was also impressive, and despite not taking a wicket, conceded just 16 runs from his seven over spell. The South Brisbane batsmen were also clueless when facing the off-spin of Jack Sinfield, who finished with the tidy figures of 1/17 from ten overs. The Tigers batsmen were practically faultless in response, chasing down the visitors’ total with a whole 16 overs to spare. 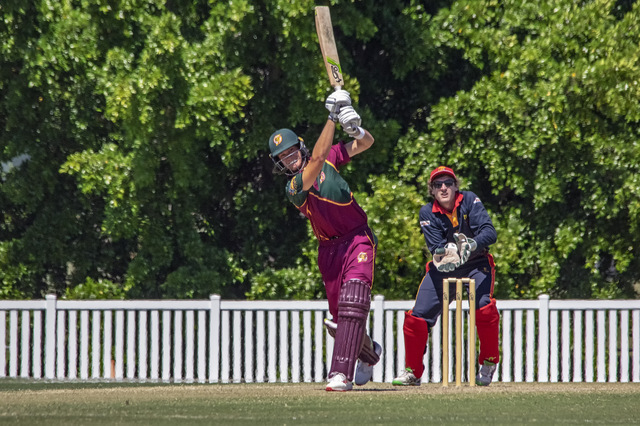 Stephan Muller led from the front to score 82 and blunt the South Brisbane attack, and alongside Jack Sinfield (36), put together an opening partnership of 63. Skipper Sam Geyer (30*) and Isaiah Shepherd (24*) saw the Tigers over the line. First through sixth grade begin two-day fixtures next Saturday, with plenty of cricket on offer at Tiger land as the summer of cricket heats up for 2018/19.